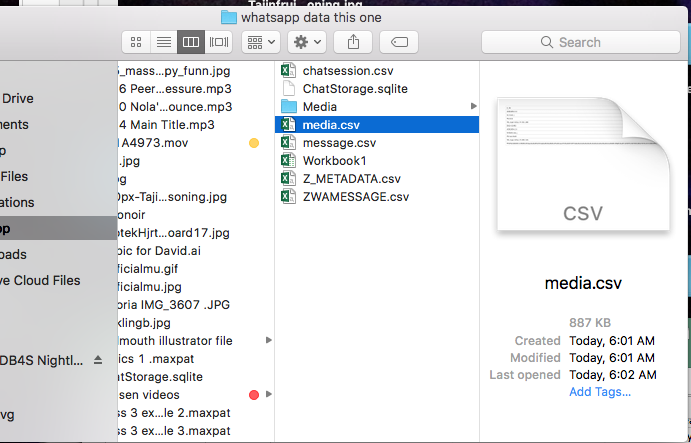 I started this project trying to work with Whatsapp Data. 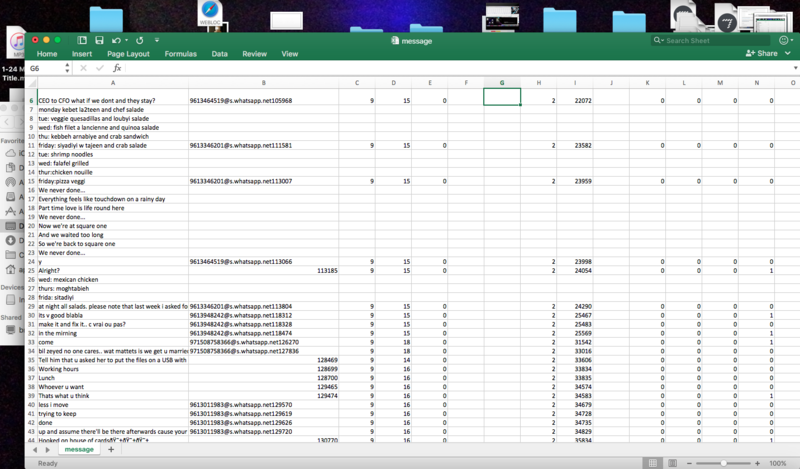 Retrieving the Data from Whatsapp is a bit complicated or need a longer process. I had downloaded IExplorer an app that Backup your phone and store it’s Data on your Mac. However certain Datas like facebook and Whatsapp need some sort of permission. 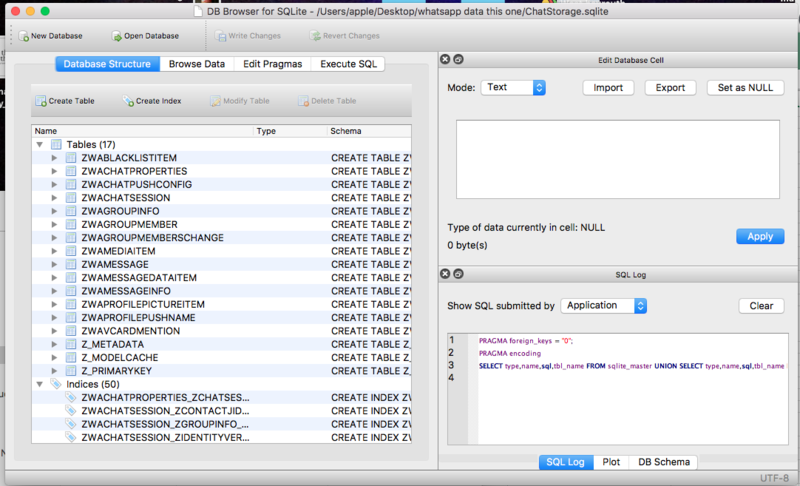 I was able to retrieve a file SQlite, I downloaded the SQlite browser for it, it turns out it dissects every fragment of the data into a separate csv… meaning, Media.csv, messages.scv and chatlog.scv separate which makes it complicated to work with the data, because they opened funny not completed. 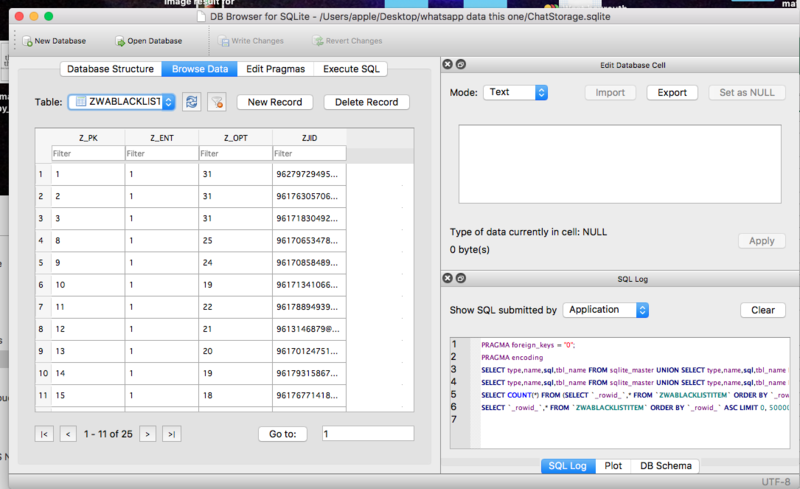 I found that with IExplorer it is easier to retrieve Imessages and directly convert them to CSV files. 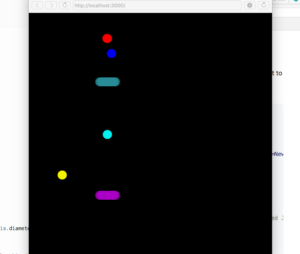 So I did that and combined few chats in one big document and played with the Data in P5js. I was able to make the Data be visualized but I think I need to work more on the output and the code to get a nicer better outcome. I tried to give each category a color to see the outcome proportionally to each other: messages, names, phone number, date. The idea is to show the different visualization of one conversation according to another. 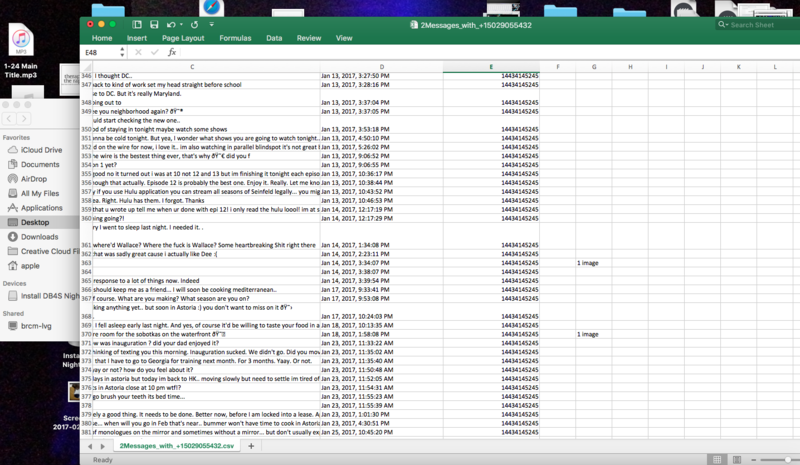 This Data is a combination of of many conversation just to get the Data out. AS soon as the visualization is fixed into something more appealing I will post the bulk difference of the same sketch changing according to the conversation. I started this project wanting to listen to my dreams. I thought It is exactly where all the illusive awareness of our conscious takes a break and let the more truthful hidden layers of our selves come out… It is where the body surrender to our fears and desires. I had had a long talk with a therapist regarding dreams but what is more important than dreams is ‘nightmares’. According to the therapist, unlike the common knowledge of people, nightmares are a more truthful expression of a certain desire or fear then in a nice dream. the latter is ‘nice’ because it is a masked metaphor or symbol to something very raw or brutal that we usually defend or hide by disguising it with something more acceptable or tolerant according to our moral and social values we grew up with. For instance “eating a yummy cup cake” is a nice dream, “being raped’ is an awful nightmare; the irony in the matter they could both symbolize a sexual desire depending on the person, the context of life, etc. The interesting difference to note is that people who are prone to see nightmares can listen more closely to their subconscious versus people who have nice dreams because they add layers and layers as a defensive mechanism to hide fears or desires. Another aspect to nightmares is the recurrent nightmare that stems from a certain fear or situation. A personal example to that. Since I was a child, every time I am stressed over anything could be work related, love or a family situation.. I ironically dream this recurrent dream where it’s war, I’m hiding because shooting is taking place in the streets, I finally reach home, knock the door and another family opens the door for me. Being a child of war, this dream somehow make sense, fear of war, fear of loosing the parents, etc.. But now that I’m 35 years old I still wake up in sweat, my heart bouncing in fear because I had this recurrent dream. Therapist said it made sense still, because whenever consciously I’m in a distressed situation, subconscious triggers this childhood nightmare… A long subject willing to explore and interested to see if I can work around it in this class. Ideally to listen and monitor sleep, as suggested by Dan O’sullivan I should have worked with the Zeo sensor to monitor the brain activity while sleeping. As Zeo wasn’t available, another suggestion was to use Kinect and monitor motion while sleeping. It remains physical true, but it could have detected some interesting aspect linked to how much one’s move a fidget while sleeping and see if we could detect a certain pattern linked to these motions over a certain amount of time (a week).. Working with the Kinect for this particular assignment wasn’t the easiest thing to do, as I had to use a PC (true nightmare) I also had to learn how to make the kinect work, also had to work it through processing, language that I haven’t used before… It was too much learning in a very small frame of time. So after trials to make it work, watching tutorials, etc… I tried over 2 night and one afternoon nap to record the motion, but couldn’t. The video wouldn’t continue recording. Though Dreams and sleep monitoring failed for this assignment, I at least learned how to work with the Kinect/processing and went through the experience and got some idea of how to make it function and the possibilities that could be done with it for different projects. However I will revisit sleep monitoring and dreams at some point with a different approach. I moved from dreams trying to detect emotions through the pulse sensor though colleagues said you can only detect through the pulse sensor physical activities, I somehow had slightly different results through the set of experiences i tried I actually saw some visible graphical changes occurring in reaction to some strong emotions. I decided to dig in my memory and think of what would trigger some strong emotions and make my heart bounce. I decided to experiment with some war memories, those well no matter how time flies, no matter how we learn to control our emotions with age, how we teach ourselves to forget and how we master putting a poker face consciously.. those well even after 25 years still make my heart race… I guess you can’t always fool the elephant. 1.First video a random video from youtube that i never watched before… to keep the element of surprise to test my emotions. 2. A scene from the movie West Beyrouth, a very good movie that talks about how the war started and depicts a very true reality that resembles very much my childhood at school. Specially that the scenes of the school in the movie are actually shot in my actual french school Lycée LAK. In the past I only watched the movie once long ago and never was able to re-watch it again.. because it reminds me of what I work hard to forget. 3. Third video is a massive attack song entitled save from harm. not that this song is linked to war, but it’s a song that would trigger memories to compare with stronger emotions like war ones. that also triggers a lot of emotions when i listen to it. As a final analysis, It is clear to me that the pulse is responding to strong emotions or memories. Even if the shift in the graph is not very big but it clearly shows a change in pattern. For instance as an example in West Beyrouth the graph shift many times but at the end of the scene when they show the school entrance a clear shift is shown; it is a very specific place where I used to hang out with friends during school. Same when kids where gathered in the school yard to sing the french Hymn and then the Lebanese one. Also very relevant while listening to Barbara, less than Massive Attack because actually the latter affects me less.